As always you can click on the thumbnail photos to see them larger. 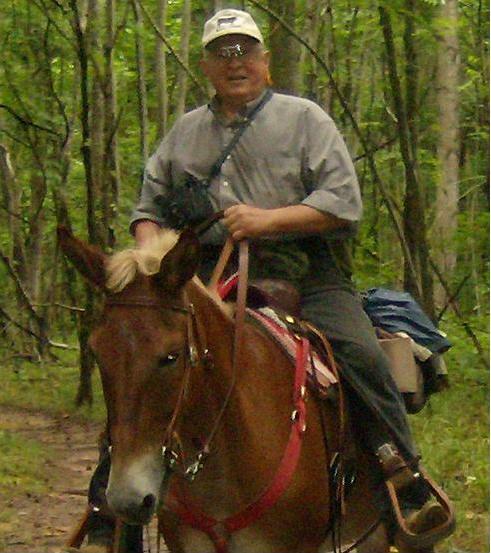 use your browser back arrow to return to the blog. Building on the curiosity I created within myself with my gravel tubs, I have embarked upon another experiment. 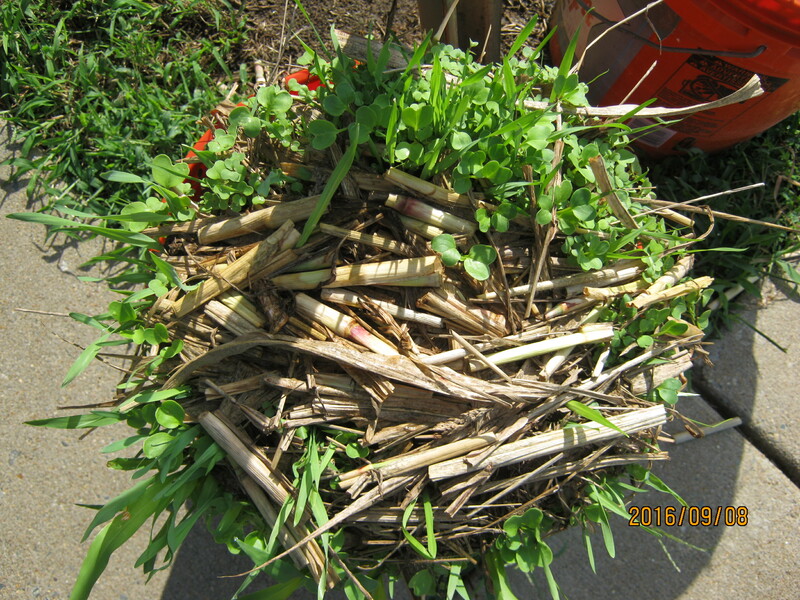 In the early summer I brought four of my cover crop buckets to work. 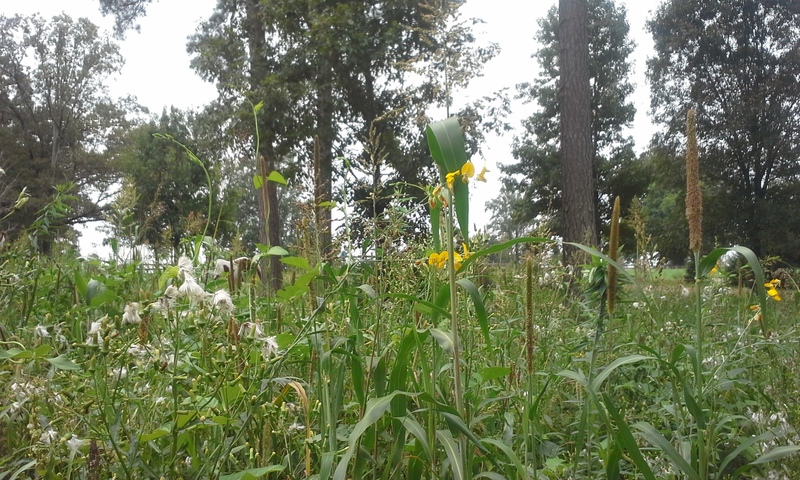 One had chicory planted in it and the other three had various summer cover crop plantings…. 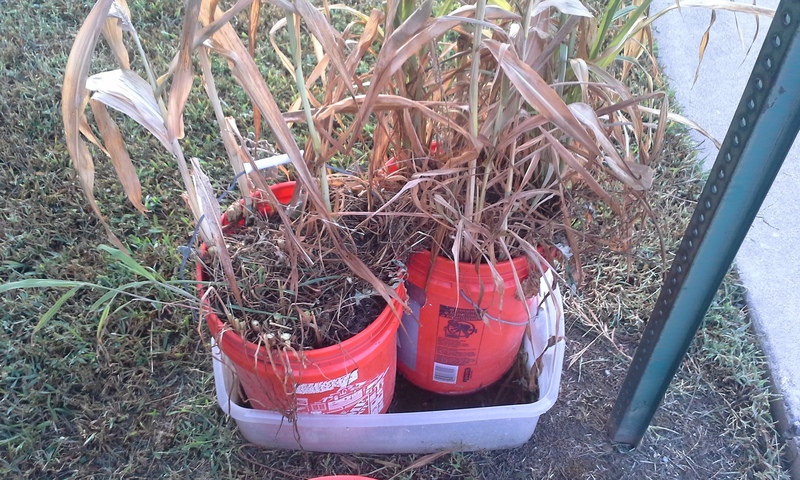 Bucket require almost daily watering because the have limited soil reserves and these bucket did not do well over the long hot summer…too many days I was not here to apply water. But I endeavor to persevere. 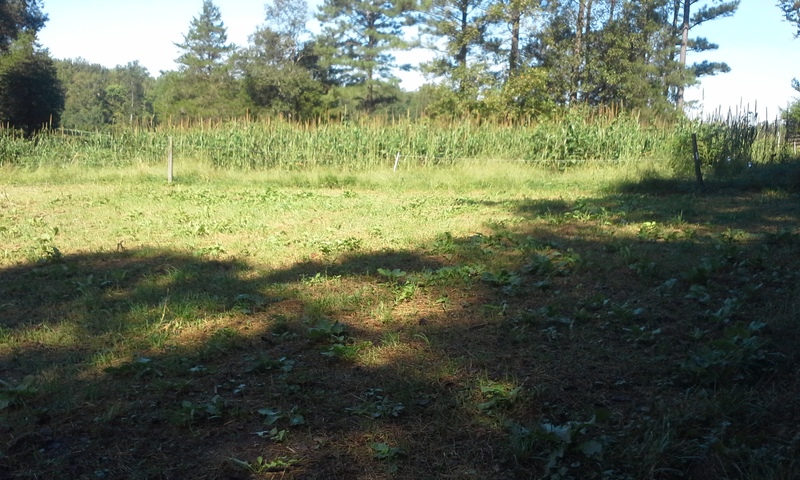 This morning I cut back everything but the chicory, a perrenial. 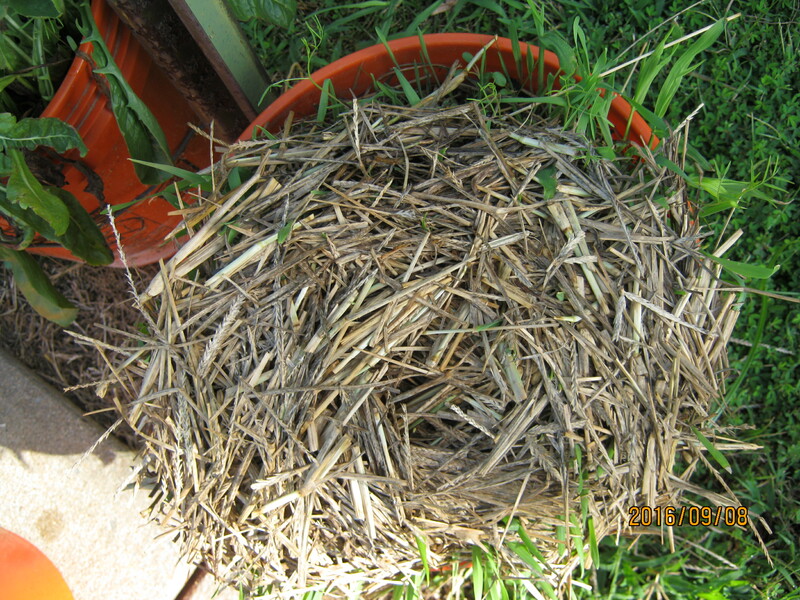 and I applied cool season cover crop seed to all four buckets and watered it in thoroughly…. 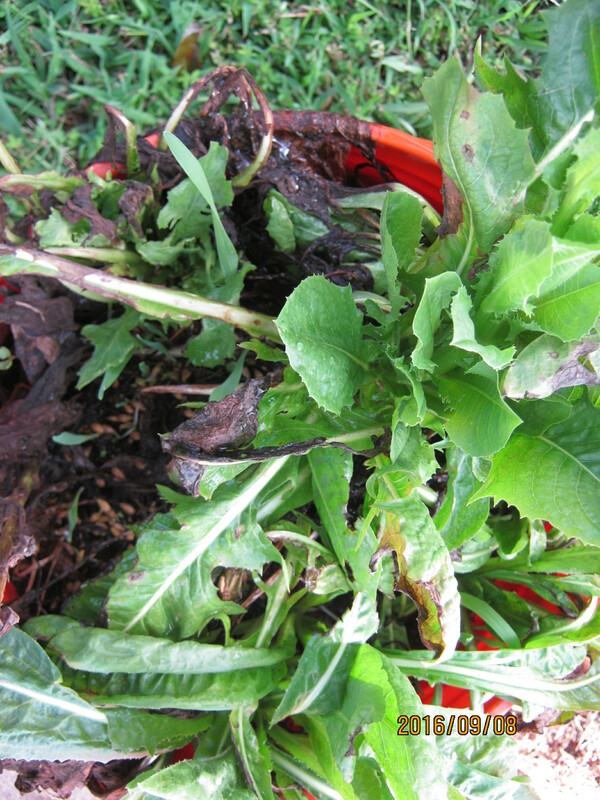 the bucket on the left is the chicory….I sprinkled some of the mix I am seeding with at home on it and watered. 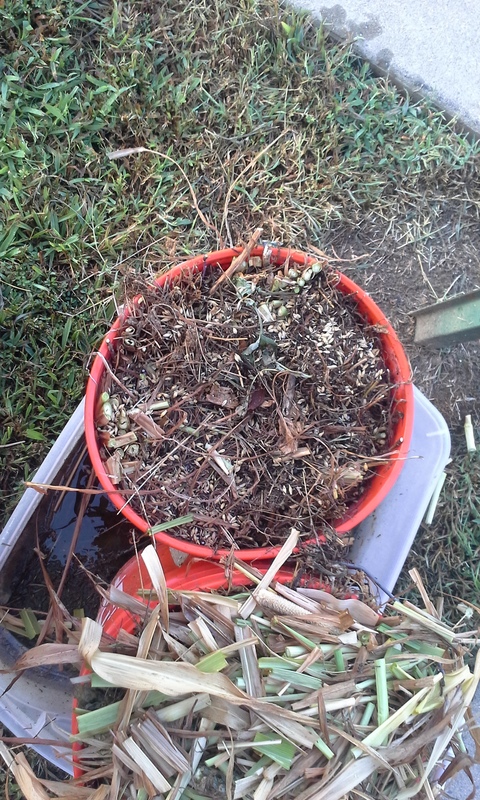 the bucket on the right started out as a summer cover but was taken over by goose grass which apparently came form the fraction of horse manure that was in the bucket. this one was sprinkled with the same seed and mulched with the residue from the plants cut off. 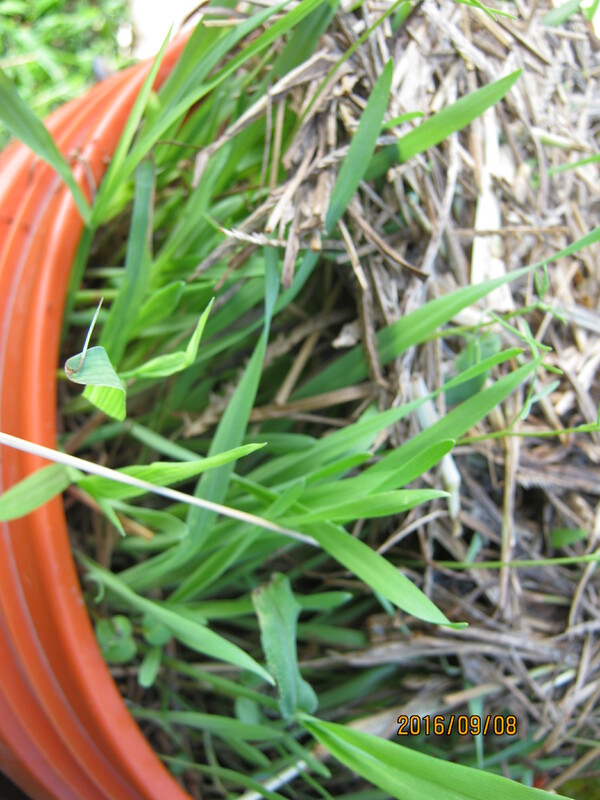 below is a photo of a partially harvested residue….I cut it off and then cut it up with hand shears and then reapply it to the bucket after seeding. in two other buckets I had two more treatments. 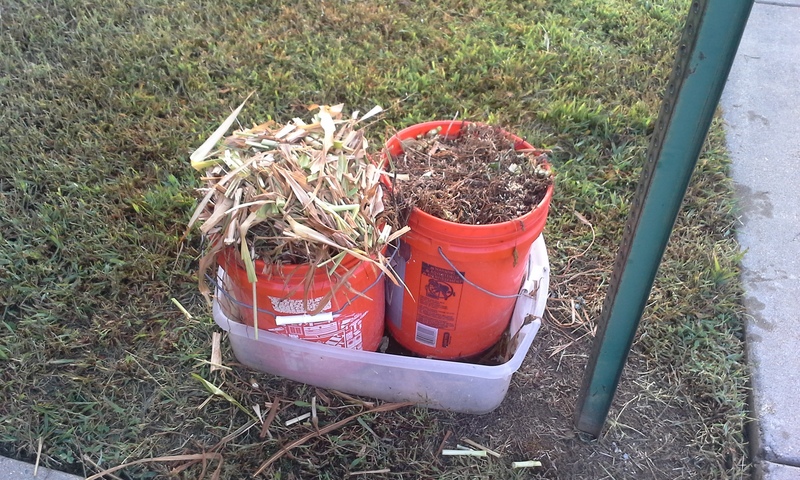 these two buckets both avoided the goose grass infestation and had what was left of the summer covers…. 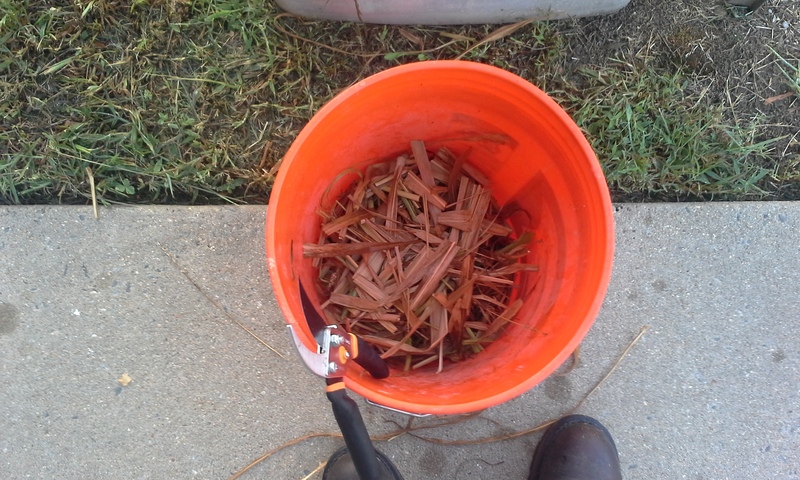 I had begun harvesting the bucket on the left when it occurred to me that I ought to take a picture…. These two buckets got two different treatments…. 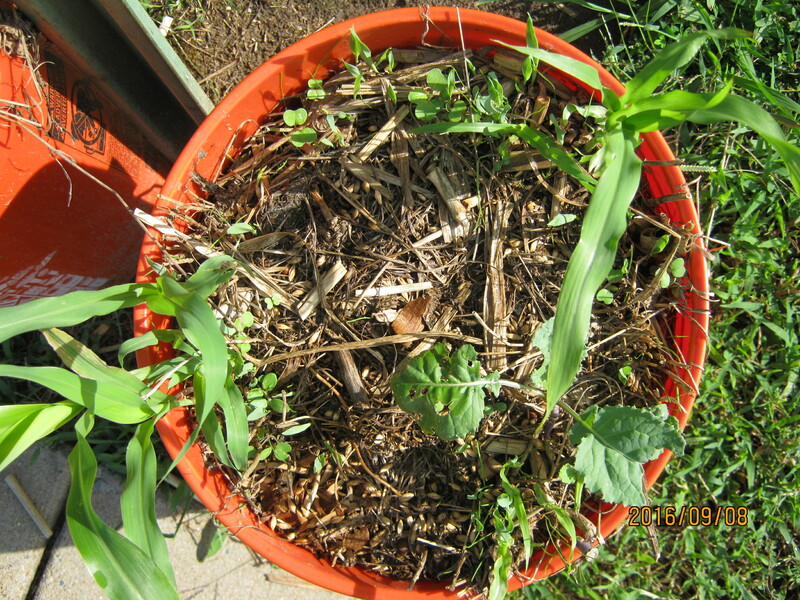 The bucket on the left was seeded to some old green cover sample jar seed that was two years old….so I put it on pretty heavy…then it was mulched with the residue from the summer plants. 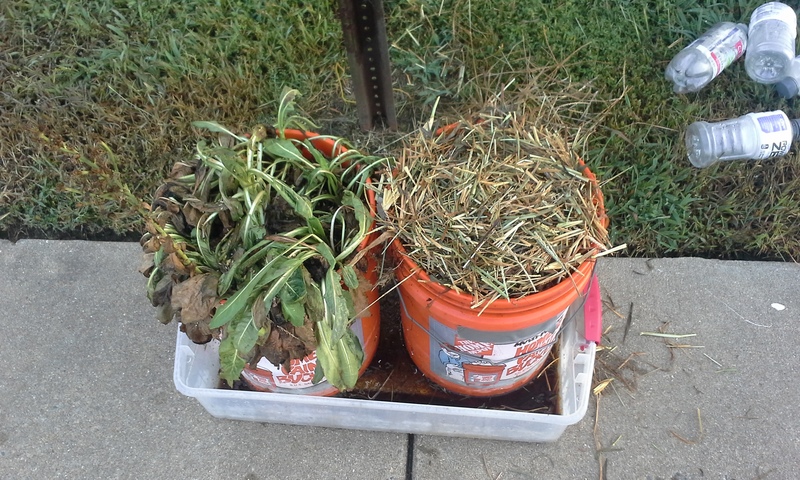 The bucket on the right was seeded with the same mix I used at home and was unmulched with no cover. I worry that it will feed the birds but nothing ventured nothing gained. 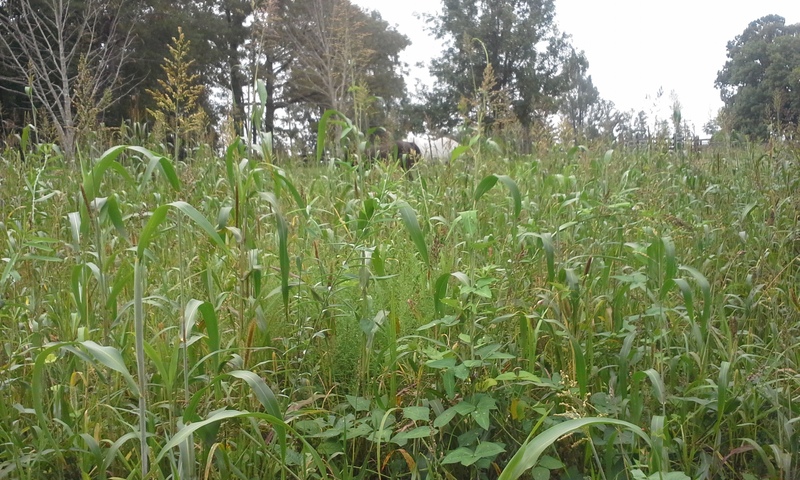 black oats, winter peas, crimson clover, nitro radish, forage collard, purple top turnips and I think barley. since this is at the front door of the our office I should be able to keep up with it in a reasonable fashion and will try to post observations….Or you can stop by and watch for yourself…. I planted chicory at home and was thrilled with it…six or seven feet tall and beautiful blue blooms most of the summer…Thus I am including it in my seedings again this fall….I found that it can be frost seeded or spring seeded or fall seeded…..what I wanted was a deep rooted perennial…..deep rooting limits its ability to grow in buckets especially crowded so it is not showing well in the buckets. The stock devour it….